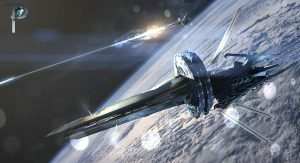 Probably the most widely found large piece of space weaponry found throughout the solar system, the KKC is practically an electro-magnetic rail gun system that accelerates a dense piece of matter to high relativistic speeds. Often better known as mass driver, accelerator cannon, coilgun or railgun, the KKC is a device that uses electromagnetic force to launch high velocity projectiles, by means of a sliding armature that is accelerated along a pair of conductive rails. It is typically constructed as a weapon and the projectile normally does not contain explosives, relying on the projectile’s high speed to inflict damage. While explosive-powered military guns cannot readily achieve a muzzle velocity of more than about 2 km/s, railguns can readily exceed 3 km/s, and exceed conventionally delivered munitions in range and destructive force. The absence of explosive propellants or warheads to store and handle, as well as the low cost of projectiles compared to conventional weaponry come as additional advantages. Typical military railgun designs aim for muzzle velocities in the range of 2000–3500 m/s with muzzle energies of 5–50 MJ. For comparison, 50MJ is equivalent to the kinetic energy of a school bus weighing 5 metric tons, travelling at 509 km/h (316 mph). For single loop railguns, these mission requirements require launch currents of a few million amperes, so a typical railgun power supply might be designed to deliver a launch current of 5 MA for a few milliseconds. As the magnetic field strengths required for such launches will typically be approximately 10 tesla (100 kilogauss), most contemporary railgun designs are effectively „air-cored“, i.e., they do not use ferromagnetic materials such as iron to enhance the magnetic flux. However, if the barrel is magnetic, i.e., produces a magnetic field perpendicular to the current flow, the force is augmented. The power supply must be able to deliver large currents, sustained and controlled over a useful amount of time. The most important gauge of power supply effectiveness is the energy it can deliver. The greatest known energy used to propel a projectile from a railgun is typically around 40 megajoules. The most common forms of power supplies used in railguns are capacitors and compulsators which are slowly charged from other continuous energy sources. The rails need to withstand enormous repulsive forces during shooting, and these forces will tend to push them apart and away from the projectile. As rail/projectile clearances increase, arcing develops, which causes rapid vaporization and extensive damage to the rail surfaces and the insulator surfaces. This limited some early railguns to one shot per service interval. The inductance and resistance of the rails and power supply limit the efficiency of a railgun design. 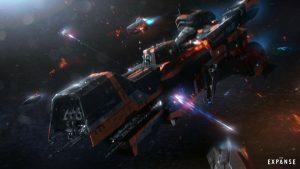 The weapon along with the huge capacitators is generally very large and heavy, making it suitable for large and slow space craft or as stationary systems only. In current designs massive amounts of heat are created by the electricity flowing through the rails, as well as by the friction of the projectile leaving the device. This causes three main problems: melting of equipment, decreased safety of personnel, and detection by enemy forces due to increased infrared signature. As briefly discussed above, the stresses involved in firing this sort of device require an extremely heat-resistant material. Otherwise the rails, barrel, and all equipment attached would melt or be irreparably damaged. Firing a kinetic kill cannon requires immediate heat dissipation by large radiators, that further increase mass and volume of the system. KKCs fire solid projectiles made from rather dense material. They usually are shaped and pointed for armor piercing purposes and fin stabilized if to be used within an atmosphere, where they are prone to melting caused by air friction. In space the exact shape of the projectile doesn’t matter, at high relativistic speeds the difference between a shaped and a non-shaped projectile becomes neglegible. Projectiles are rather small and lightweight, usually having a mass between 3 and 15 kg. Railguns are capable of firing up to 10 shots per minute. It is possible to fire more than a single projectile in a shot, by accelerating several projectiles in a line, creating a small cloud of missiles. This dramatically increases the heat and wear on the weapon system while the chances to hit the target only increase slightly. Therefore this is not a practiced use of the weapon system and no gun engineer would recommend it. One downside of using KCCs in space is the fact that fired projectiles that miss their targets are going to accelerate continously and travel onward in a straight line until they hit another object. That could be a friendly ship or a planet behind the target, sometimes lightyears away. The kinetic energy of even small projectiles travelling at speeds near the speed of light is devastating even to large objects. A 1 kg mass traveling at 99% of the speed of light would have a kinetic energy of 5.47×1017 joules. In explosive terms, it would be equal to 132 megatons of TNT, or approximately 75 megatons more than the yield of Tsar Bomba. 1 kg of mass-energy is 8.99×1016 joules, or about 21.5 megatons of TNT. This makes the weapons rather dangerous to all parties involved in large scale space battles or in the vicinity of orbital space stations. Misguided projectiles entering denser atmospheres are very likely to completely disintegrate due to their high speed and friction heat.